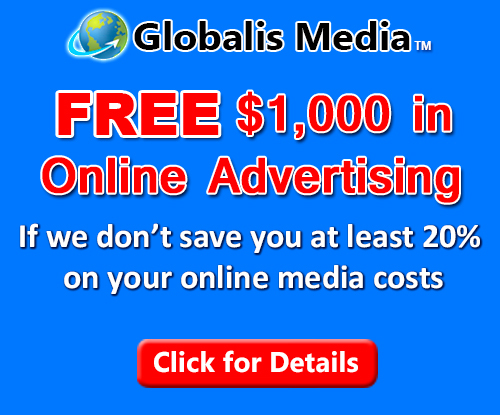 FREE $500 in Online Advertising if we don’t save you at least 20% on your online media! 1) Tell us about the campaign(s) for which you would like us to reduce your costs by at least 20%: what countries / states / cities, what contextual targeting, what type of media: text / display banners, video ads, mobile ads. 2) What is the metric on which you would like us to reduce your costs by at least 20%: CPM, CPC, eCPV, eCPA? 4) Your actual total gross cost should be the basis for the metric we will beat. For example, if you bought 50,000 clicks for $0.08 CPC, your media cost is $4,000. If there was also an agency fee of $1,000 to buy your media and manage your campaign, then your total gross cost was $5,000, and your gross CPC cost was $0.10. This is the number we would guarantee to reduce by at least 20%. 5) Sign an insertion order for at least US $2,500. All terms and conditions are detailed in the insertion order. 6) Implement a Google DoubleClick remarketing (retargeting) tag supplied by us on your web site. 7) If the metric we are reducing for you is eCPA, implement a Google DoubleClick conversion tracking tag on your web site’s confirmation page. Contact us today to start reducing your online advertising expenses by at least 20%!